Fontana Lake stretches 26 miles from Bryson City up towards Fontana Dam. Public access points dot the fingers across the lake with pontoon boats, stand up paddle boarding, kayaking, and more. We offer a number of cabin rentals that are conveniently located near this beautiful lake. 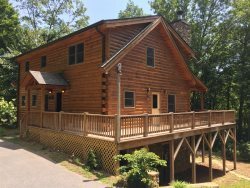 Our vacation cabin rentals offer amazing views, access to outdoor activities like hiking, rafting, and ziplining, as well as luxurious fireplaces, hot tubs, and plenty of space for large groups. Many of our cabins are pet-friendly as well! With our diverse offering of rentals, we make it easy for you to find a place that will make your vacation memorable.